'People of the Parting Rocks' for The Pulitzer Centre on Crisis Reporting. The Attawapiskat First Nations Community under the Northern Lights. 'People of the Parting Rocks' for The Pulitzer Centre on Crisis Reporting. Heading home after Pow Wow practice in Attawapiskat, Ontario. 'People of the Parting Rocks' for The Pulitzer Centre on Crisis Reporting. The St. Mary's cemetary in Attawapiskat, Ontario. 'People of the Parting Rocks' for The Pulitzer Centre on Crisis Reporting. 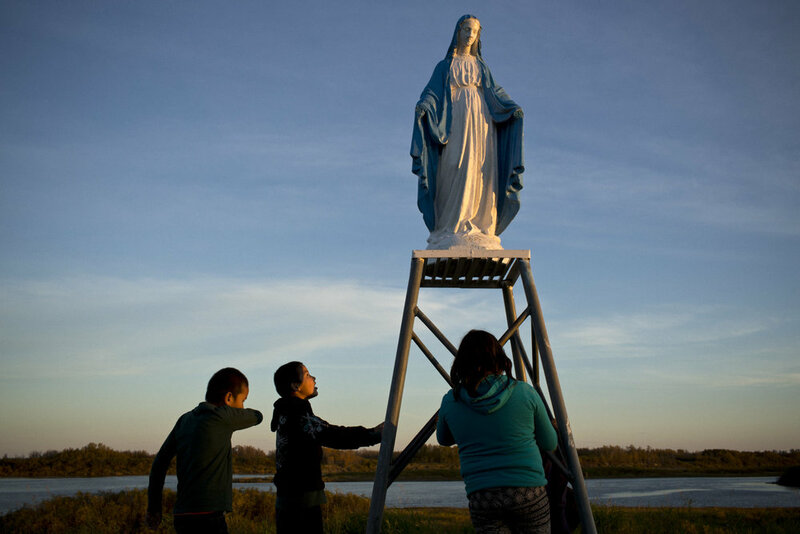 Children play near a statue of the Virgin Mary in Attawapiskat, Ontario. 'People of the Parting Rocks' for The Pulitzer Centre on Crisis Reporting. 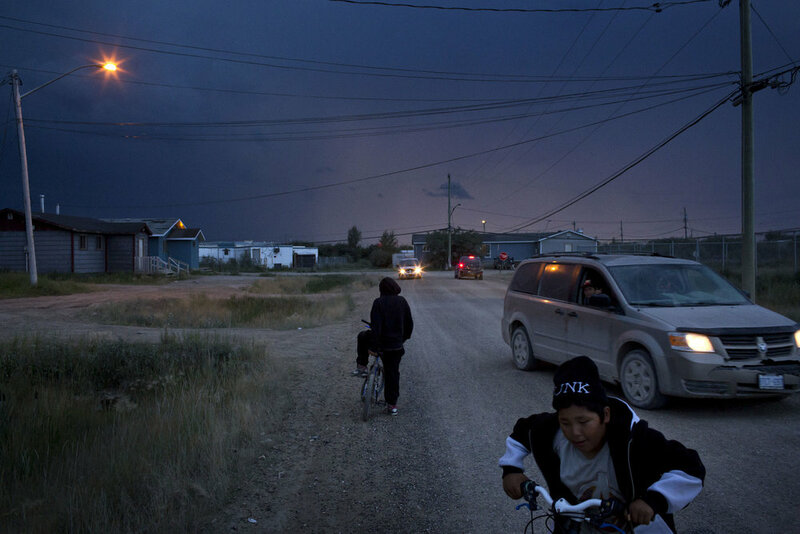 Teens gather at dusk in Attawapiskat, Ontario. 'People of the Parting Rocks' for The Pulitzer Centre on Crisis Reporting. 'People of the Parting Rocks' for The Pulitzer Centre on Crisis Reporting. 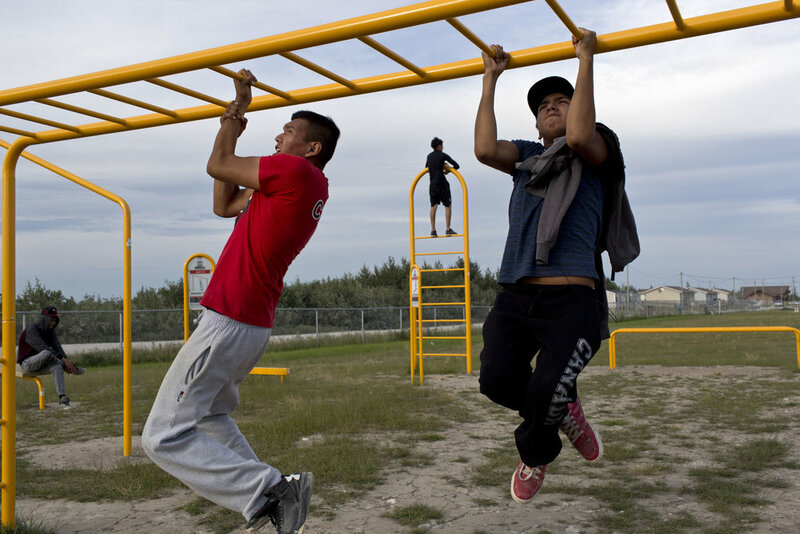 Young men exercise at an outdoor gym in Attawapiskat, Ontario. 'People of the Parting Rocks' for The Pulitzer Centre on Crisis Reporting. Dusk in Attawapiskat, Ontario. 'People of the Parting Rocks' for The Pulitzer Centre on Crisis Reporting. 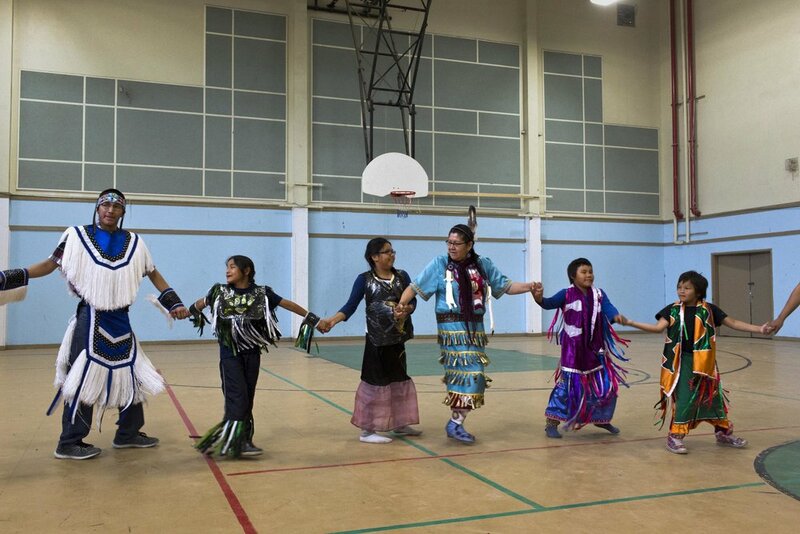 Pow Wow practice in the Reg Louttit arena in Attawapiskat, Ontario. 'People of the Parting Rocks' for The Pulitzer Centre on Crisis Reporting. Families gather at the St. Mary's cemetery in Attawapiskat, Ontario. 'People of the Parting Rocks' for The Pulitzer Centre on Crisis Reporting. The skinned carcass of a female polar bear, shot hours earlier in Attawapiskat, Ontario. 'People of the Parting Rocks' for The Pulitzer Centre on Crisis Reporting. The pelt of a female polar bear, shot hours earlier is washed in Attawapiskat, Ontario. 'People of the Parting Rocks' for The Pulitzer Centre on Crisis Reporting. 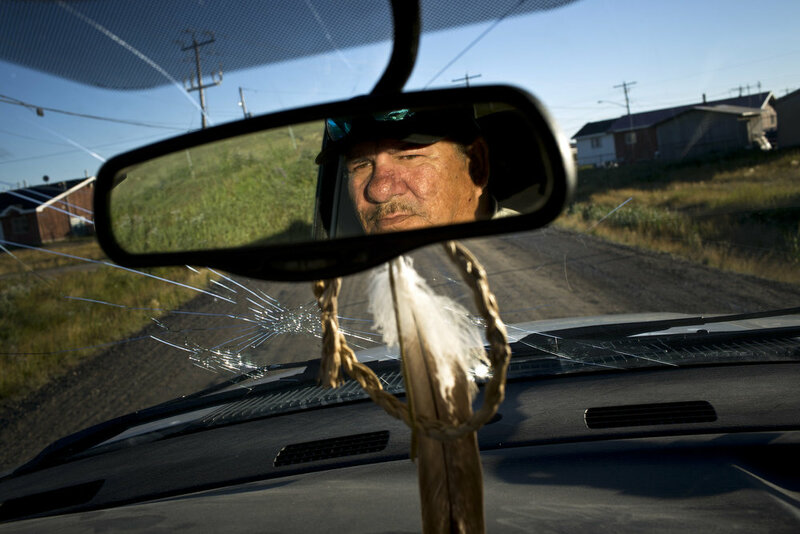 Jack Linklater drivs a local taxi service in Attawapiskat, Ontario. 'People of the Parting Rocks' for The Pulitzer Centre on Crisis Reporting. A boy learns to shoot in anticipation of the spring goose hunt in Attawapiskat, Ontario. 'People of the Parting Rocks' for The Pulitzer Centre on Crisis Reporting. 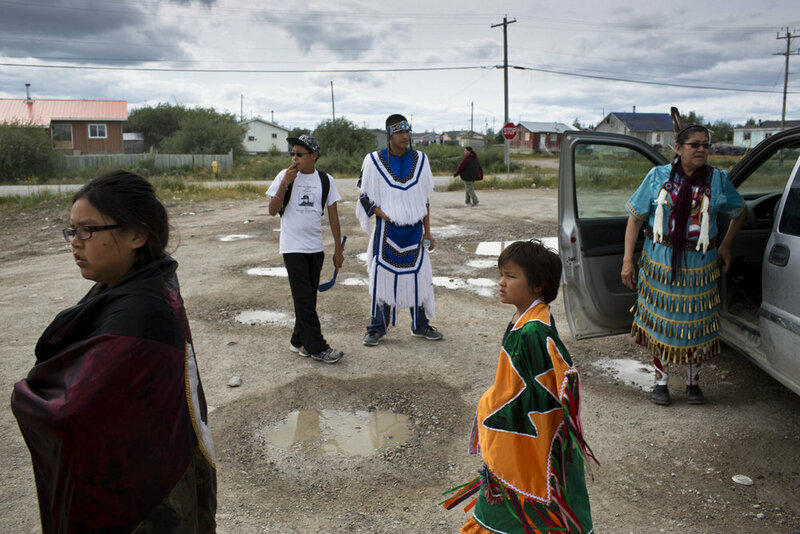 The First nations community of Attawapiskat, Ontario. 'People of the Parting Rocks' for The Pulitzer Centre on Crisis Reporting. An Auntie swims with her niece and nephew in the Attawapiskat river in Attawapiskat, Ontario. 'People of the Parting Rocks' for The Pulitzer Centre on Crisis Reporting. Sam Koosees with his three-year-old daughter Arianna in Attawpiskat, Ontario. 'People of the Parting Rocks' for The Pulitzer Centre on Crisis Reporting. A young couple in Attawapiskat, Ontario. 'People of the Parting Rocks' for The Pulitzer Centre on Crisis Reporting. Martina Koosees with her son Korey in Attawapiskat, Ontario. 'People of the Parting Rocks' for The Pulitzer Centre on Crisis Reporting. A young mother's arms show the tell-tale scars of self-harm in Attawapiskat, Ontario. 'People of the Parting Rocks' for The Pulitzer Centre on Crisis Reporting. 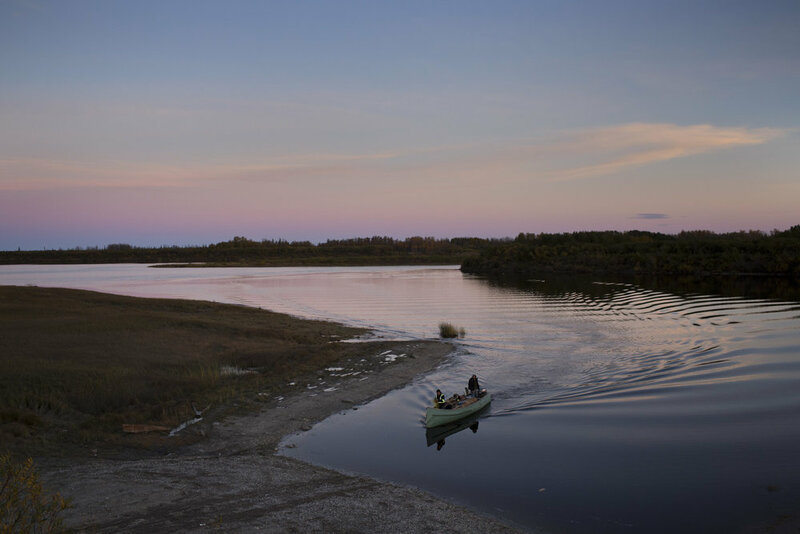 Dusk in the Frist Nations community of Attawapiskat, Ontario. 'People of the Parting Rocks' for The Pulitzer Centre on Crisis Reporting. A family returns home from cutting firewood in Attawapiskat, Ontario. 'People of the Parting Rocks' for The Pulitzer Centre on Crisis Reporting. Joseph Wheesk at home in Attawapiskat, Ontario. 'People of the Parting Rocks' for The Pulitzer Centre on Crisis Reporting. Young men forage wild berries in Attawapiskat, Ontario. 'People of the Parting Rocks' for The Pulitzer Centre on Crisis Reporting. The Attawapiskat river in Attawapiskat, Ontario. 'People of the Parting Rocks' for The Pulitzer Centre on Crisis Reporting. 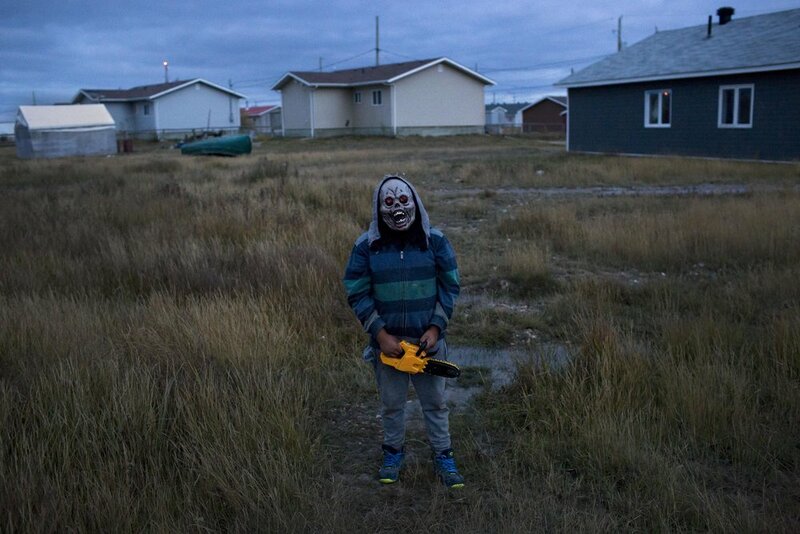 A youth models his Halloween costume in Attawapiskat, Ontario.